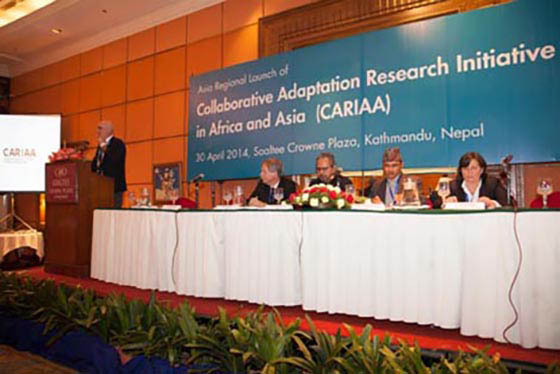 The International Development Research Centre (IDRC), New Delhi, in collaboration with the International Centre for Integrated Mountain Development (ICIMOD) launched the Asia Regional chapter of 'Collaborative Adaptation Research Initiative in Africa and Asia (CARIAA)' on 30 April 2014 in Kathmandu, Nepal. The Initiative is a seven-year US$ 70 million research programme for understanding climate change and adaptation in some of the most vulnerable regions in Africa and Asia. Through the Initiative, four consortia will conduct research in three hotspots where demographic trends and strong climate signals put large numbers of people and their livelihoods at risk. The hotspots include semi-arid regions, deltas, and Himalayan river basins. The Initiative aims to build the resilience of vulnerable populations and their livelihoods in these hotspots, and is funded by Canada’s International Development Research Centre (IDRC) and the UK’s Department for International Development (DFID). The launch introduced the programme and its consortia to stakeholders in the region and stimulated early engagement around the research they will be conducting. It was attended by more than 150 Nepali and international government officials, researchers and development practitioners, diplomats, and representatives from development partners, international organizations, and media. The CARIAA participating countries from South Asia are Bangladesh, India, Nepal, and Pakistan.